Tired of carrying your whole bulky wallet around? Get a money clip wallet! 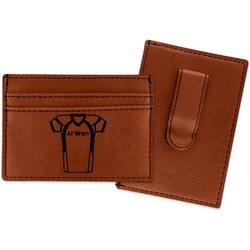 Small enough not to leave a huge bulge in your pocket and large enough to hold some cards and cash. It's the perfect in between wallet. Made from a smooth brown leatherette material, these money clip wallets are the perfect accessory. They measure at approximately 4" x 2.75". On one side there is a money clip where you can slip in your cash. On the other side are three card slots for an ID and credit card or two. The money clip wallet will be laser engraved with your design on the side with the credit card slots. The graphic will come out as a black color. Get designing in our design center! Pick a cool graphic, monogram, or font to personalize your wallet and make it yours. Have a blast searching through all our design elements to choose from. If you ever need any help figuring out our website, just give us a call! Looking for something else? Check out our leatherette money clip and bifold wallet. These make for amazing gifts for the special guys in your life!